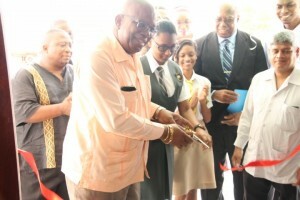 Finance Minister, Winston Jordan cutting the ribbon to officially open the new office of the Ministry of Finance’s Student Loan Agency. Graduates and students of the University of Guyana (UG), who fail to repay tuition fees, will soon be barred from leaving the country, Finance Minister, Winston Jordan announced Friday. “All information on recalcitrant borrowers will be eventually put at all immigration points and we will also set up a desk at the same time for those who will be stopped from travelling to make the necessary arrangements for payment of the loan or the debt prior to departure,” he said. He explained that although the stamping of passports of UG student loan debtors was not proposed to or discussed by Cabinet, agreement was reached to post the database of debtors at all immigration ports of entry and exit. Speaking at the opening of the Finance Ministry’s new Student Loans Office at UG’s Turkeyen Campus, Jordan also announced interest reduction packages for those who make arrangements to repay their loans by August and September, 2016. In keeping with a wide-ranging audit report into the operations of the Student Loan Agency, the “Jubilee offer” will be a 75 percent reduction in the accumulated arrears of interest if borrowers pay their indebtedness no later than August 31, 2016 or a 50 percent reduction in accumulated arrears of interest if borrowers bring their accounts up to date by September 30, 2016. “If, however, a borrower defaults subsequently interest so waived will be restored to the borrower’s account,” he said. The Finance Minister also announced that before guarantors endorse student loan applications, credit reports on them would be pulled from the credit bureau, CreditInfo. “Once we get the database intact, this database will be uploaded to the credit bureau and students will be required to pull a credit report prior to receiving a loan,” he added. Jordan further announced that loans would be given only to Guyanese students residing in Guyana for 180 days continuously during a calendar year and they must be holders of valid Guyana passports. Borrowers, who switch from one programme to another, would first have to pay off the full sum of all outstanding loans before accessing a new loan. Letters of notification will be sent to borrowers one month after the loan is issued. “In the event of a failure to respond positively by borrowers after a reasonable period has elapsed following a demand for payment, the government will exercise all options to recoup the debt including litigation,” he said. Jordan said if the students cannot be located the notifications would be sent to their guarantors. He said that guarantors would now have to provide liability statements and/ or credit reports from the Credit Bureau. Students would be required to commence repayment on or before tyhe one-year grace period once they have secured employment.